I'm writing a novel that plays in 1945 Vienna. 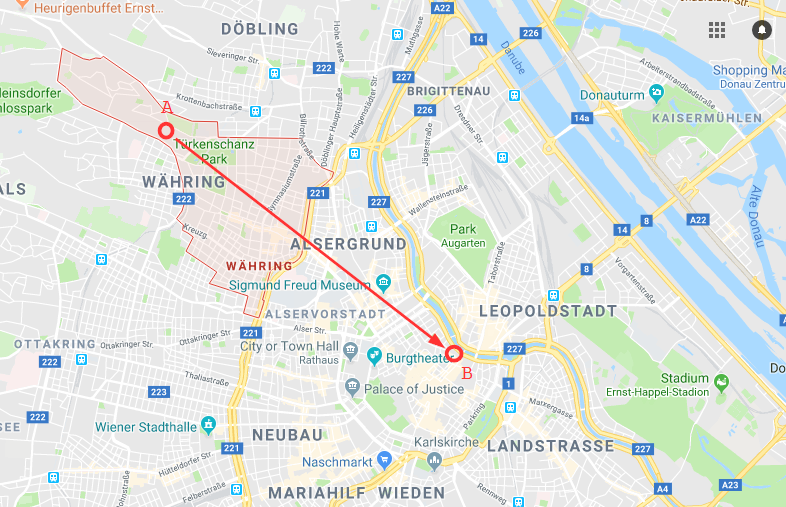 There are characters who want to get from Währing (A in the image below) to the city center (B) undetected. Is this realistic/believable for them to travel this route underground (in the sewage system; occasionally getting to the surface)? Justification #1: The modern sewage system covers most of Vienna (see below). Justification #2: Both the starting point and the destination of the journey are located in old parts of Vienna. According to German Wikipedia the first sewage system that covered the entire city was completed in 1739. If I assume that the building in Währing and most of the buildings in the city center were built somewhere during the 19th century, it is reasonable to assume that they were connected to the sewage system in 1945. Justification #3: Both Währing and the city center are wealthy districts. It is reasonable to assume that people in these areas got the canalisation first, before inhabitants of poorer districts. You are writing fiction - there is no need to be 100% accurate. The Vienna sewer system was, and still is, regarded as one of the most impressive in Europe. Although repairs from WW2 bombing were not completed until 1950, this did not interfere with a fascinating portrayal of the sewer system in 1949's The Third Man. My opinion is that if the protagonists encounter, and need to detour around, bombing damage once or twice, your audience will willingly suspend any disbelief that the portrayal is 100% accurate. Note: Bombing damage was sufficiently severe that there were legitimate cholera concerns, as the system had become essentially non-operational. This in essence means that there was significant damage somewhere on every major drainage route in at least one place. However no cholera epidemic occurred (suggesting that seasonal flooding was never extreme in the 5 years immediately post-war, though I was unable to confirm this), and complete restoration in just five years suggests that the total extent of damage was moderate. Serious bombing of Vienna only started in 1944 after the Western Allies established an airfield at Foggia in Italy. The most severe bombing was not until February and March of 1945. Not the answer you're looking for? Browse other questions tagged world-war-two europe austria or ask your own question.